Has your child has complained of pain and tenderness at that area of the foot whenever he/she is engaged in physical activity? If your child has experienced such pain that normally goes away after resting only to come back when engaging in more physical activity, then he/she may just have Sever’s Disease. 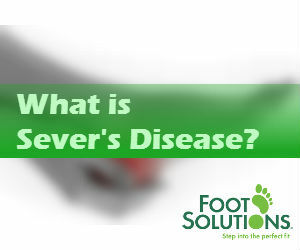 Sever’s disease is a painful bone disorder that results from inflammation (swelling) of the growth plate in the heel. A growth plate, is an area at the end of a developing bone where cartilage cells change over time into bone cells. As this occurs, the growth plates expand and unite, which is how bones grow. Sever’s disease is a common cause of heel pain in growing kids, especially those who are physically active. It usually occurs during the growth spurt of adolescence, the approximately 2-year period in early puberty when kids grow most rapidly. This growth spurt can begin any time between the ages of 8 and 13 for girls and 10 and 15 for boys. Sever’s disease rarely occurs in older teens because the back of the heel usually finishes growing by the age of 15, when the growth plate hardens and the growing bones fuse together into mature bone. During the growth spurt of early puberty, the heel bone sometimes grows faster than the leg muscles and tendons. This can cause the muscles and tendons to become very tight and overstretched, making the heel less flexible and putting pressure on the growth plate. The Achilles tendon is the strongest tendon that attaches to the growth plate in the heel. Over time, repeated stress (force or pressure) on the already tight Achilles tendon damages the growth plate, causing the swelling, tenderness, and pain of Sever’s disease. The immediate goal of treatment is pain relief. Because symptoms generally worsen with activity, the main treatment for Sever’s disease is rest, which helps to relieve pressure on the heel bone, decreasing swelling and reducing pain. Although Sever’s disease generally heals quickly, it can recur if long-term measures are not taken to protect the heel during a child’s growing years. One of the most important measures is to make sure that kids wear good quality, well-fitting shoes with shock-absorbent (padded) soles help to reduce pressure on the heel. The doctor may also recommend shoes with open backs, such as sandals or clogs, that do not rub on the back of the heel. Shoes that are heavy or have high heels should be avoided. Other preventive measures include continued stretching exercises and icing of the affected heel after activity. If a child is overweight or obese, the doctor will probably also recommend weight loss to decrease pressure on the heel. The risk of recurrence goes away on its own when foot growth is complete and the growth plate has fused to the rest of the heel bone, usually around age 15. Visit Foot Solutions today to see how we can help. We can recommend the right type of footwear & we also carry a broad range of arch supports to suit your individual needs.